The Australians have their own, indigenous form of precision target shooting–the Fly Shoot. 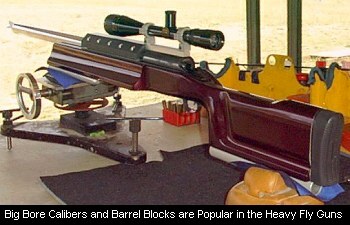 It’s a form of score shooting at 500 meters (with bonus points added for group size). The course of fire is 5 shots on the Fly target plus up to 3 sighting shots at steel or paper. There are two classes, Heavy Gun and Light Gun. Light Guns are limited to 17 pounds (similar to IBS and NBRSA Light Gun), while Unlimiteds have no weight restriction. There is no dominant caliber, though the Aussies seem to favor the larger calibers–big 30s and even .338s. You are allowed to shoot any chambering under .50 caliber. Barrel Blocks and tuners are legal. Any stock configuration and any scope is allowed, and Competitors may spot for each other. It’s a game of few rules–and lots of fun. 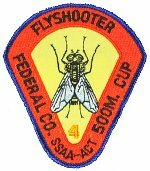 The Federal Cup is the main Fly Shoot event of the year and is shot on a Holiday weekend in March each year. The “Fly Shoot” originated in Canberra in 1990. It was set up by Jim McKinley and John Rawson. A wide variety of cartridges are used in all calibres from 22 to 338. But given the heavy mirage that is often present, to be sure of seeing the shots one needs to shoot a larger calibre and have good optics (such as Nightforce scopes). 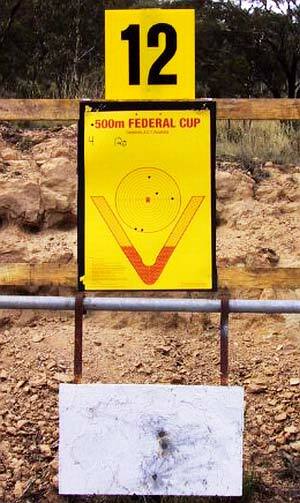 The Federal Cup held in March has four major sponsors, Federal Cartridge Co, Westfire, ADI and Lightforce. In the center of the target is a “Fly”. It represents a March Fly and is the ultimate in fly shooting. A special Fly Patch (left) is awarded for hits on the fly. The photo below shows the target system used at Canberra for the 500m Fly Shoot. The official Fly target is on top with a metal sighter plate (“splash plate”) below. These “splash plates”, made from heavy-duty Bisaloy 360 steel, can swing from hangers thereby absorbing the shock of even the heaviest magnums. Sighter shots on the plate show up as large dark spots. This way at least the sighters can be seen in heavy mirage. Shots are counted for score and bonus points are awarded for group size. The maximum points available per target is 60. CLICK HERE for more information on 500m Fly Shoots. You can view photos of Forum member Wild Bill’s very trick 6mm Dasher Fly Gun in THIS THREAD. It features metal rails in the front and a Stiller barrel tuner. Here are standings for 2007 Fly Shooter of the Year. Jaegen Peet leads the field, followed by Trevor Bent, Ian Davis, and Peter Van Meurs. 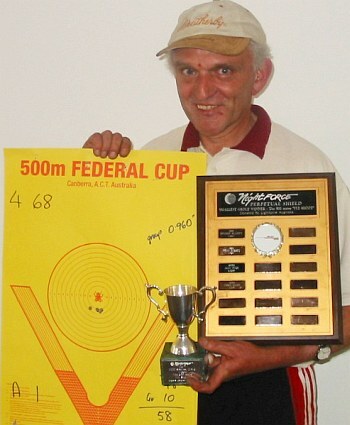 The image below shows Peter with his record target shot in 2002, five shots in .960″ (24.4mm) at 500m. The 4-shot cluster measures roughly about 0.4″. That’s spectacular. This was the first sub-inch group at 500m. Share the post "Accuracy Aussie-Style — 500m Fly Shoot"